I thought I’d wear a cheerful outfit for a day of fun and shopping around Hong Kong. I don’t know why but it somehow reminds me of marshmallows. I can’t quite pinpoint if it’s because of the white polka dots, or the overall cuteness of this outfit. It’s even fluffy and soft like a pillow! (See, I sound like I’m describing a marshmallow.) Either way, marshmallow outfit or not (or just my brain being weird), I’m head over heels in love with this co-ord top and skirt from Stylenanda. You all must know by now how much I adore this Korean brand–always fashion-forward and made in the best quality. Lately, they’ve got a bunch of new styles in neoprene fabric like what I’m wearing, so if you’re a fan of the trend, hurry and pay its website a visit! I love your outfit ate Cams so adorable. :) love your bag. OMG!!! I love this top+skirt!!! I love this purse and shoes!!!! You look like an adorable Marshmallow miss Cams. haha! Buti di ka napagkamalang walking marshmallow! The outfit really looks fluffy tho! Ahhhh, I am so into this look, Camille! Wonderful! Teehee! Thanks Katrin! 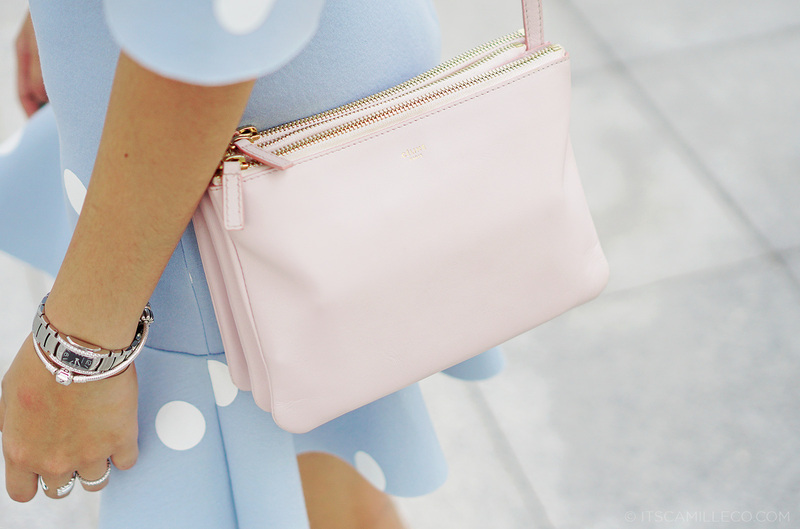 :) I like it when I wear pastels too! OMG, I love this OUTFIT!!! It’s so cute, totally my style. And I love your bag from Celine. I also have the same bag, but different color. I like yours, what color is it called? It’s very beautiful! I don’t know if it looks like marshmallow))), but it looks very fresh, light and in pastel shades, very very cute!!!!!!!! If you’re wearing that outfit to a Fashion Week, you’re probably a head turner! :) Love that set! It reminds me marshmallow too, it looks so sweet and soft… You look amazing :). Order online!!! :) Well, around November I think :) Post na!